Keyless Gate Lock Lockey 1150DC Spring Latch Double Sided Is A Double Sided Combination Lock With A Lever Handle. ADA Compliant. Choice Of 3 Finishes. Keyless Gate Lock Lockey 1150 MG Spring Latch Single Sided Is A Pick Proof And Bump Proof Lock With A Lever Handle. Marine Grade FOR SALT WATER ENVIRONMENTS. Keyless Gate Lock Lockey 1150DC MG Spring Latch Is A Double Sided Combination Lock. ADA Compliant. Marine Grade FOR SALT WATER ENVIRONMENTS. Keyless Gate Lock Lockey 1600 Spring Latch Single Sided Is A Pick Proof And Bump Proof Lock With A Round Knob And Passage Function. Available In Your Choice Of 5 Finishes. Antique and Bright Brass Being Discontinued. Huge Discounts. Keyless Gate Lock Lockey 1600DC Spring Latch Double Sided Lock Has A Combination Pad On The Inside As Well As Outside. Available In 3 Finishes. Keyless Gate Lock Lockey 1600 MG Spring Latch Single Sided Is A Pick Proof And Bump Proof Lock With A Round Knob And Passage Function. Marine Grade FOR SALT WATER ENVIRONMENTS. 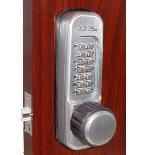 Keyless Gate Lock Lockey 1600DC MG Spring Latch Double Sided Has A Combination Pad On The Inside As Well As Outside. Marine Grade FOR SALT WATER ENVIRONMENTS. Lockey Keyless Entry Door Lock 1150 Spring Latch Is A Mechanical Lock With A Lever Handle And Passage Function. ADA Compliant. 3 Finishes. Lockey Keyless Entry Door Lock 1150DC Spring Latch Is A Double Sided Combination Lock With A Lever Handle And Passage Function. 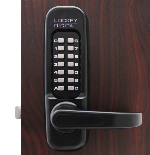 This Lock Is ADA Compliant And Is Available In Your Choice Of 3 Finishes. 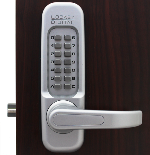 Lockey Keyless Entry Door Lock 1150 MG Spring Latch Is A Pick Proof And Bump Proof Lock With A Lever Handle. ADA Compliant. Marine Grade FOR SALT WATER ENVIRONMENTS. Lockey Keyless Entry Door Lock 1150DC MG Spring Latch Is A Double Sided Combination Lock With A Lever Handle And Passage Function. ADA Compliant. FOR SALT WATER ENVIRONMENTS. Lockey Keyless Entry Door Lock 1600 MG Spring Latch Is A Pick Proof And Bump Proof Lock With A Round Knob And Passage Function. Marine Grade FOR SALT WATER ENVIRONMENTS. Lockey Keyless Entry Door Lock 1600DC Spring Latch Has A Combination Pad On The Inside As Well As Outside. Available In 4 Finishes. 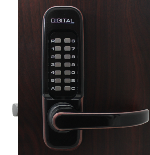 Lockey Keyless Entry Door Lock 1600DC MG Spring Latch Has A Combination Pad On The Inside As Well As Outside. MADE FOR SALT WATER ENVIRONMENTS.